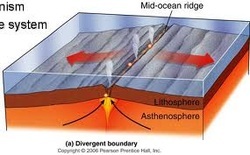 A mid-oceanic ridge is an underwater mountain system that consists of various mountain ranges (chains), typically having a valley known as a rift running along its spine, formed by plate tectonics. 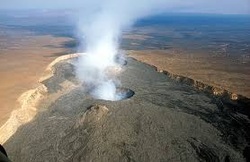 The most well known is the Mid Atlantic Ridge, which was the initial breakup up Pangaea around 250 million years ago. Rift Valleys form on a divergent plate boundary, where tectonic forces split apart the continental surface, which deepens by the forces of erosion.